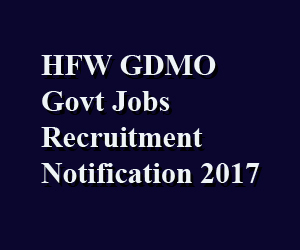 HFW GDMO Govt Jobs Recruitment Notification 2017 : The application fee for APPSC MO posts is Rs. 120/- for APST and Rs. 180/- for others. The application fee should be paid by the way of DD/IPO in favor of Secretary, Arunachal Pradesh Public Service Commission, Itanagar. The application form and the syllabus can be downloaded from the APPSC official website www.appsc.gov.in. The candidates who wish to apply for APPSC MO Posts may apply before 09-08-2017 by 4 p.m.
HFW GDMO Govt Jobs Recruitment Notification 2017 : The age of candidates who apply for APPSC MO should not exceed 30 years. However, a relaxation for 5 years is extended in the case of SC/ST candidates under the specifications of State Government of Arunachal Pradesh. The candidate must undergo the written test conducted by the Board of APPSC. General Medicine including Cardiology, Neurology, Dermatology and Psychiatry. Surgery including E.N.T. Ophthalmology, Traumatology and Orthopaedics. Preventive, Social and Community Medicine. Personality test and general Aptitude. General Medical Subjects for MO. Stree rogas and prasuitantra with ayurvedic therapeutics. Organon of medicine and philosophy. The candidate should download the application from the official website after paying the above said application fee. Fill the application form with the required details and attach the attested copies of the certificates stating educational qualification, nativity, age, caste along with 2 recently taken passport size photographs with one attested. Arunachal Pradesh Public Service Commission.